The Huffington Post gets a lot of criticism for the way it runs its digital content business, including its “crowdsourcing” of free content, which has led to a class-action lawsuit by a number of bloggers who now want to be paid in the wake of the site’s $315-million acquisition by AOL (s aol). But if there’s one thing that The Huffington Post has consistently done better than just about any other traditional or new-media entity, it is to take advantage of social media tools in order to boost its reach and engage with readers in new ways, and the site has just rolled out some new features that take that effort to a new level. 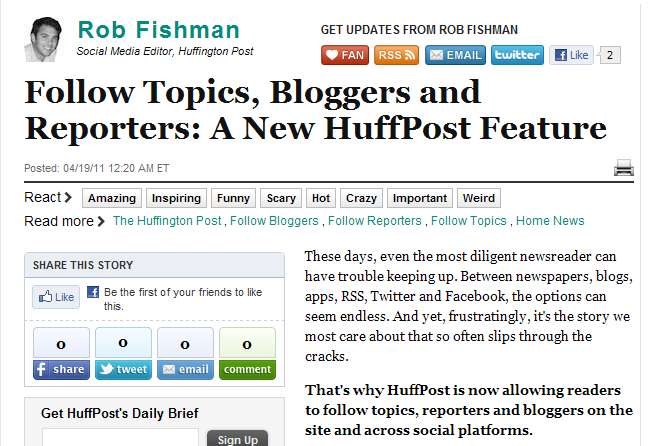 In a nutshell, the new features — which have been in beta testing for the past week or two, but were officially announced on Tuesday in a blog post by Huffington Post social-media editor Rob Fishman — allow users to “fan,” “like” and “follow” individual reporters and bloggers for the site, both on the site itself and via Twitter and Facebook. Readers can also choose to follow a specific topic in the news by clicking a button at the top of a news story. In both cases, any posts from the writer or stories related to that topic will show up in a user’s Twitter stream and will also appear in their Facebook news feed, with links to an auto-generated topic page. Of course, you can already follow certain Huffington Post writers and bloggers on Twitter, and you can friend them on Facebook in some cases as well. But implementing these kinds of “follow me” features at the top of a news story or blog post is a smart move — and something that other publishers and news entities might want to consider. 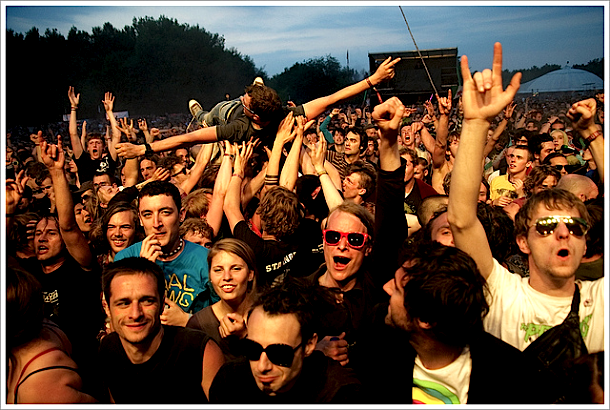 It’s an easy form of personalization, which is something digital media does well. If I only care about a specific topic or a specific writer, why not make it easy for me to follow just that writer and get stories and blog posts that are relevant to me? The New York Times (s nyt) has writers who have started to develop a following through Facebook and other social media. Foreign correspondent and columnist Nick Kristof makes great use of his Facebook page to engage with readers, and reporter CJ Chivers has been using Twitter extensively while writing about the ongoing upheaval in Libya, as well as posting to a Tumblr blog. But readers have to already know about their use of these tools in order to find and follow them. Features like The Huffington Post has launched would make it easier for them to connect and get updates from their favorite writers. National Public Radio staffer Andy Carvin has shown how powerful it can be when a journalist uses social media effectively, by curating and aggregating Twitter reports from Egypt and Libya, and has driven tens of thousands of dollars worth of donations to NPR stations in the process. Could following individual reporters lead to some kind of monetization stream for media companies? That’s impossible to say at this point, but it’s not out of the realm of possibility. The important thing is that The Huffington Post is experimenting with these kinds of features, just as it experimented with Foursquare-style “badges” for readers who moderated comments or provided good feedback. And it was one of the first major publishers to implement integration with Facebook Connect and the social network’s “open graph plugins” last year, which showed readers a social dashboard with articles that had been read, shared or commented on by their Facebook friends. That and the integration of Facebook comments drove huge amounts of traffic and engagement for the site. The Huffington Post isn’t the only site doing this kind of thing. Social news site Mashable has also launched something similar, which allows users to join a Mashable-based social network and follow writers. But few traditional publishers or media sites have taken these kinds of steps. That may not be surprising, given the industry’s lack of innovation in the past, but it’s still a missed opportunity. Again, low-hanging fruit that HuffPo’s been able to take advantage of quickly and quietly. Think it’d take months for many news organizations to integrate properly, let alone approve/make an ROI case for this sort of project! I agree, Daniel — this kind of thing is not rocket science, but few traditional outlets seem to be taking advantage of it. I think this is largely because traditional news outlets are still very much resistant to the idea of putting the focus on the people doing the work. For instance, I briefly worked in a news organization that wasn’t exactly stodgy but when the names of section editors began to be more prominently displayed, some didn’t like it. The traditional ethos isn’t to draw attention to oneself, to do your work quietly and not cause a stir. This is clearly in direct contradiction to the digital ethos which by the very nature of the medium makes it necessary to not just produce great content, but to market it widely and trumpet one’s work. Some “old school” journalists have learned this lesson and embraced it, but they seem to be in the minority.